The Dalmatian became popular in the 1800s in England as carriage dogs. They are often used as Firehouse mascots. 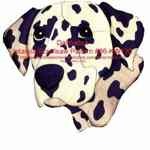 This pattern consists of 110 pieces when complete and measures 11.5 inches high and 12.5 inches wide.